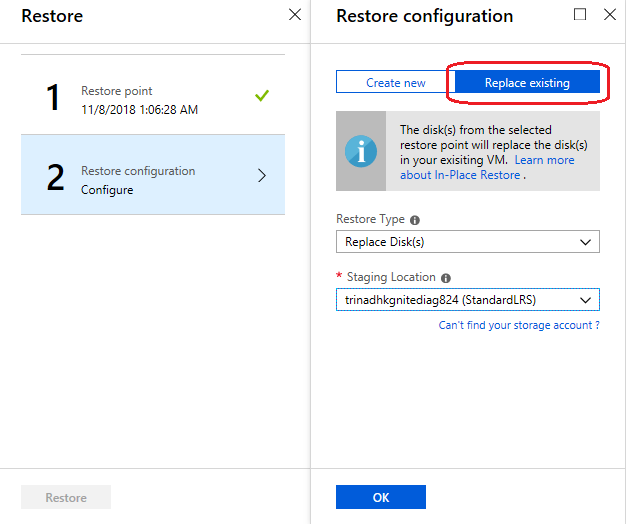 We are excited to announce In-Place restore of disks in IaaS VMs along with simplified restore improvements in Azure Backup. This feature helps roll back or fix corrupted virtual machines through in-place restore without the needs of spinning up a new VM. With the introduction of this feature, customers have multiple choices for IaaS VM restore like create new VM, Restore Disks and Replace disks. Azure Backup first takes the snapshot of the IaaS VM before replacing the disks as the replace operation modifies the production VM. The snapshots taken are stored in the Staging location provided by the user. On successful completion of step 1, the existing disks connected to the VM are replaced using the selected restore point. In parallel to the step 2, the snapshot created in step 1 is copied to the vault and retained as per the customer specified retention policy. Replace existing option is currently supported for unencrypted managed VMs. It is not supported for generalized VMs and for VMs created using custom images. We are also looking forward to add a capability to replace Azure VMs when restoring.